It’s not exactly the season for making maple syrup, but it’s always the season for eating it, right? 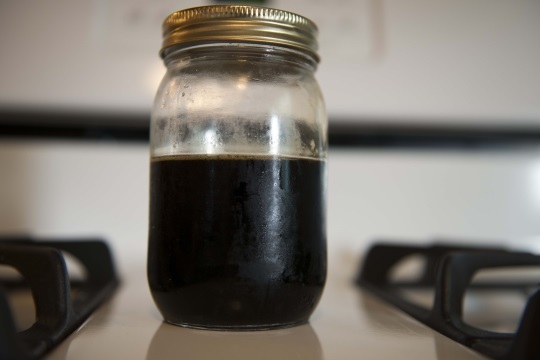 David Arment shares photos of syrup being made, along with the finished product, a remarkably dark syrup which I’m sorry I can’t sample over the internet somehow. David explains: We lived on 15 acres of wooded ground. One of the local Amish guys asked if he could tap the trees. My wife told him “yes” if he would give us some syrup from his work. The first picture is his contraption to gather sap from the maple. Pam (my wife) went and watched him boil down the sap… and that is the second picture. You can see the boiler is wood fired. Pam has the syrup people sell her the darker syrup. She says it comes from sap from the trees later in the year. I thought it was from cooking it longer but she said that would increase the viscosity and that is not the case with her syrup. So I guess she’s right. Again. 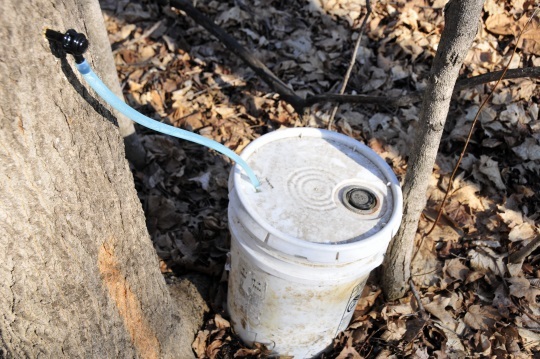 You can see another syrup-related photo of David’s, of sap being collected in a local park. Does anyone prefer the fake maple syrup to the real stuff? It’s funny that some foods are that way–in rare cases, the fake version holds it own with the real McCoy (I’m thinking imitation crab meat, and possibly some fake cheese products–am I missing anything?). I’m not sure that’s the case with maple syrup–for starters, the thicker, stickier mass-produced stuff almost seems like a different product entirely. But it’s one I have to say I enjoy–maybe (and I hesitate to admit this) even more than the real thing 🙂 . I used to purchase store bought maple syrup until I got some Amish-made. I won’t go back to store maple syrup again. The taste is so much better in the Amish-made. Another thing is you don’t have to use as much of the Amish-made as you do in the store bought. Real maple syrup that is a finer grade, has almost a liqueur quality to it. The fake stuff cannot hold a canlde to it. The darker the syrup, the more it tastes like sugar and less like maple, at least to me. I too would like to taste her dark syrup to see how it compares. I can see how the store-bought, fake syrup might appeal to some, but since it’s basically high fructose corn syrup flavored with a tiny bit of very late season, very dark, real syrup or real syrup derivative, and since high fructose syrup is to be avoided, I don’t buy the fake stuff. The reason late season maple syrup is darker is that the sap itself begins to change as the top of the maple trees “wake up.” At first, the sap is mainly water along with a bit of sugar, but as the tree begins to swell its buds, the sap begins to carry other components such as tannins, that, when the sap is boiled down, make the resulting syrup darker and more robustly flavored. However, the sugar content of the sap, while varying from tree to tree a bit, doesn’t usually change much from the beginning to end of the season, at least as far as I’ve ever noticed, boiling down about 20 or so taps for my own family’s use. Sometimes I think our tastebuds like what we grew up with best…at least I know I’m that way with certain things. For instance, I can make potato salad many ways, but if I don’t use a little Miracle Whip, it just doesn’t taste right! Lol! We are not big syrup users at our house so I’ve never had Amish-made syrup, but I know we prefer Amish-made jams, so we will have to get some and try it! Good article…I always learn something from your posts! Thanks! We much prefer the darker, grade B syrup. I’ve heard that it’s better for you, richer in minerals, etc, but we just like the flavor better than light colored syrup. Where do these Amish live? Our daughter was in school in Vermont and on our visits there we of course had lots of delicious maple syrup, and learned about all the grades of syrup, the candies and butters, etc After the real stuff, we just can’t use the fake stuff at all! Imitation crab meat – really, Erik!! This is the northern Indiana Amish area. I remember running into a number of Amish doing maple syrup in Geauga County. That would have been over three weeks in early-mid April, which I think is still prime maple syrup time. Nah… I prefer the real McCoy… The fake stuff is too cloyingly sweet.. Gimme good ol Amish made maple syrup every day.. I like the darker grade b stuff too.. but I’ve never seen any as dark as in that picture.. what we get is much lighter.. I buy mine from an Amish guy by the gallon and then bring it home & re-can it in quart jars.. Makes it much easier to manage and I get a much better price on it by buying it by the gallon. If you like maple-syrup, try Shagbark Hickory Syrup. It’s similar to maple syrup but has its own flavor and besides the regular “plain” syrup, it comes in lots of flavors, like raspberry walnut, rhubarb, etc. We like it on pancakes & waffles but also on Greek yogurt. That sounds delicious, and fun to eat when the family is reading the Shagbark Hickory series together. No worries at all Mark, if someone has a product recommendation they are free to share it, it’s not spam after all 🙂 . That hickory syrup sounds delicious. Some questions on maple syrup. As someone above mentioned, I would be curious to know if this is in the northern IN area where David and Pam currently live, or if it is somewhere else. I would like to try some Amish-made syrup. Any suggestions on where to find it — is it just sold locally, or does it reach a wider market. And particular label to look for? One of our state parks hosts an annual showing of how the Indians (Native Americans, if you prefer) made maple syrup. I would be curious to know if, except for a few more modern pieces of equipment, if the Amish follow the same basic process. One other thing: How careful does one have to be to not take too much from a given tree. Obviously it would be unwise to tap-off so much that the health of a tree is threatened, else a person would endanger the long-term harvest for the short-term. How do you prevent that threat? I grew-up with and used all my life the fake maple syrup (Log Cabin, Mrs. Butterworth’s, etc.). A few years ago I purchased real maple syrup and haven’t looked back. Actually, to be honest I don’t know which I’d take, if I had to choose. I should probably do a taste test, maybe the power of pancake breakfast memories has weakened over the years. Just to be clear, I definitely DO like the real stuff too. I have lived in South Africa most of my life and although we get maple syrup here, it is so very expensive. I lived in Canada for a short while and had syrup whilst living there. Always thought it is brilliant stuff. Can’t stand the smell of maple syrup! Give me cane syrup any day! I, too grew up with Log Cabin. I also used to love maple candy—the Brachs kind, or sometimes the maple leaf “real” kind. But when I was diagnosed with diabetes, I cut down on my syrup use (probably once a month rather than 4-6 times a month), so I use “lite” (fake) syrup. It’s really not bad, for what it is…I prefer the Splenda-sweetened over aspartame sweetened. In fact, I bought some organic maple syrup in the last few months & it seems too sweet to me, and not Maple-y enough. Growing up, my Mom often made her own “pancake syrup” using Mapleine maple flavoring (blue & white box with a bottle inside), sugar & water. It’s probably better for you than those using high fructose corn syrup, but as a diabetic who doesn’t use much syrup these days, anyway, it seems like too much trouble for what it’s worth. After working all day at the library, I just want to come home and READ! In Orange County Indiana in the conservative Paoli Amish settlement (aka the Bromer settlement), much maple syrup is made every year and is sold year-round. I’ve bought it from at least five different producers, trying to find which one has the best! Tater Road (CR 500 E) or Lynd School Road. If you don’t see any signs for maple syrup, stop at any Amish farm and they’ll tell you who all sells syrup. A lot of the Amish settlements will have people that make maple syrup. There is an Amish guy in Topeka Indiana that makes Evaporators and other equipment. I made 10 gallons this last season. I grew up on Log Cabin. Mrs Butterworths was the fancy stuff that my mom wouldn’t buy. Better than Log Cabin and it had that cool glass (at the time) bottle. We have been making maple syrup on our farm in Middle Tennessee for a little over ten years now. As a maple tapper, I can answer a few questions about the process. First, the lighter grades of syrup are generally from the first sap runs of the season because early sap tends to have a higher sugar content than later sap, usually around 1.5 to 2%. Because maple syrup is 67% sugar, the early sap requires less boiling time, hence less caramelization takes place, resulting in a lighter color and a more delicate taste. Personally, I prefer a darker syrup because it has a more robust flavor. As for how much sap comes from a tree, a typical maple will yield about twenty gallons or so of sap per tap. A tree should be at least ten inches in diameter for one tap, about 2 feet for a second tap, and three feet for a maximum of three taps. Sap runs require a hard freeze overnight and daytime temps in the forties, preferably on a sunny day. I hang a 4-gallon bucket on each tap, and on a good day the sap can actually overflow the bucket. I usually put out 40-60 taps at a time, which keeps me hopping. 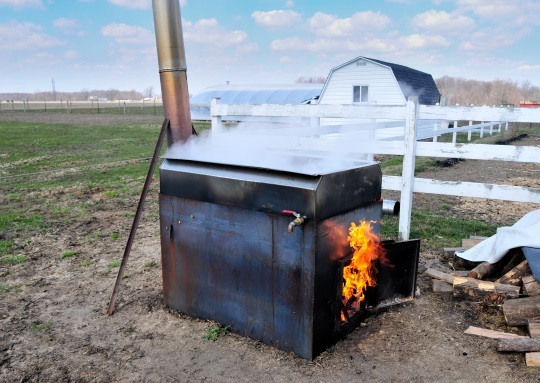 It takes about 40 gallons of sap on average to make one gallon of finished syrup, the other 39 gallons going off as steam. Since my evaporator is wood-fired, a lot of stove wood goes up in smoke as well! Surprised nobody has mentioned sweet sorghum syrup. My favorite. I’m in Northern Missouri, near Jamesport, and this is probably one of the best areas in the country if you like sorghum syrup. It’s even available at Hy-vee (the major grocery store in this part of the country) around here though people in other parts of the country sometimes don’t even know what it is! I buy it from Hy-vee sometimes but prefer to buy from an Amish store. I bought some the other day near Jamesport from a store which I believe is run by either Old Brethren German Baptists or maybe Mennonites. Not sure, but the girls working there had patterns on their dresses (as I understand it Amish women usually wear solid colors). I’d like to grow some sorghum myself someday. I don’t have the equipment to press it or anything but it’s a neat process. You boil it down, just like making maple syrup. A nice thing about sorghum is that the ratio of juice to finished syrup is about 10 to 1 (it takes about 10 gallons of sorghum “juice” to make 1 gallon of sorghum syrup). Compare that to maple which takes about 40 gallons of sap to make 1 gallon of finished syrup. Sorgum is much more efficient, requiring much less fuel (wood, natural gas, etc.) to produce a given amount of syrup compared to maple.